Those who don’t believe in the spirit life after death may change their tune after checking this out. 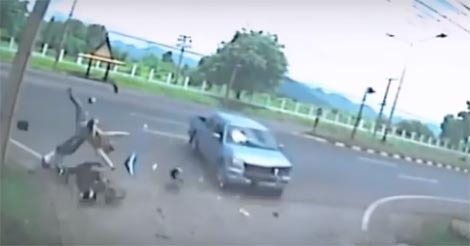 Usually it’s some sort of visual proof one needs, and this accident video certainly provides just that. A tragic accident occurs when a truck hits a woman on a motorcycle. The woman hits a telephone pole, dies right away. Then this happens. You’ll likely have to review it several times as it’s hard for even the believers out there to realize what they are witnessing. The bike gets hit and the woman goes right into the power pole. That’s when suddenly a black silhouette of a person can be seen, haven risen out from the woman’s body. This certainly gives a lot of thought about the idea of afterlife, spirits, and so forth. Rarely do we see a death on video, as it happens. Especially one where the person dies instantly. Often people can remain alive after horrific accidents, part of their vitals still operating. But here, it is more than clear, that a life has indeed ended in brutally instant fashion. And with that, be warned that indeed it is pretty graphic, though it goes by quick. It’s a death and it’s not pleasant to view, but many may believe the fascinating after-image is showing a new life of spirit beginning. Share with others who can handle such a video and start a discussion on whether it appears real and could in fact be footage of an actual spirit leaving one’s body!